Biobest Antalya and Antilsan today announced that, as of January 1st, 2015, all activities related to biological control and pollination in Turkey will be fully integrated in Biobest Antalya. Biobest Antalya, set up as a production joint venture between Antilsan and Biobest in 1998 has become Turkey’s leading producer of bumblebees for pollination. Antilsan has built a strong distribution presence in the Turkish market for pollination and biological control. Its success is based on the quality of its technical advice and a strong product offering combining bumblebee hives from Biobest Antalya with biocontrol solutions from the Biobest group. The rapid growth of the Turkish market requires further investments in production and distribution. Antilsan and Biobest Antalya decided to opt for a streamlined integrated setup covering all production and distribution activities inside Biobest Antalya. “We are excited that the teams of both companies will be working together in Biobest Antalya”, says Mehmet Oba, Sales Director of Biobest Antalya: “Turkish agriculture is rapidly gaining momentum. 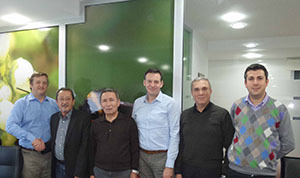 Biobest Antalya has a compelling proposition to Turkish growers: a strong team of experienced IPM advisors in the field and a unique combination of state of the art local production infrastructure with the know-how and the innovation pipeline of a global leader”.